A look at the health scenario across the country paints a sorry picture. The death of children in hospitals is staple news on most days in the country. However, the recent news of around 70 children, including neonates, dying in one week in the pediatric ward of Baba Raghav Das Medical College (BRD Medical College) in Gorakhpur came as a reprehensible expression of the rotting primary healthcare system in India. Further to add to the tragic incident that left multiple families devastated is the political game played over it. Political junkies have been all over it with sound bites overshooting reasonable decibel limits by several notches. The aftermath of every tragedy as is typical in India is escorted with political jargon and brickbats full of sound and fury signifying nothing. Ultimately most of these rabble-rousers quieten down having met their political ambition until another tragedy strikes, and the proletariat is forced to succumb to the same theatric all over. A look at the health scenario of the state would help one to understand the situation better. Encephalitis has been claiming hundreds of lives in the state every year. According to a report by the directorate of National Vector Borne Diseases Control Programme, 26,686 cases of encephalitis were reported in Uttar Pradesh between 2010 and August 2017. Of these, 24,668 cases were of Acute Encephalitis Syndrome (AES) and 2,018 of Japanese Encephalitis (JE). Out of those reportedly suffering from AES, 4,093 deaths were registered, and 308 JE deaths were recorded in the same period. The report gives figures till 6th of August, 2017, which shows 924 AES cases with 127 deaths and 97 JE cases with three deaths. Baba Raghav Das Medical College, which tackles encephalitis and meningitis cases every year, has a budget of just Rs 5.32 crore for medicines, according to the state budget figures. This scenario isn’t surprising or unique. Healthcare spending is abysmal in our country, irrespective of state, and that is not a secret. Research published in Lancet shows that India ranked 154 out of 195 countries regarding healthcare access, far behind countries like Bangladesh, Nepal, Ghana, and Liberia. 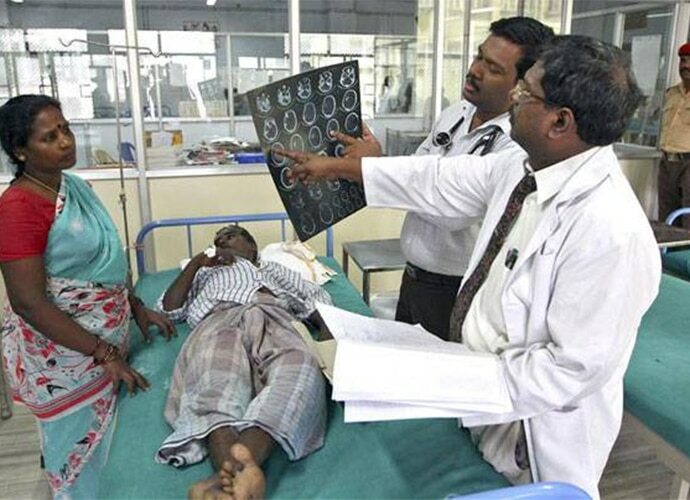 India spends only 5 per cent of its GDP on public healthcare. India has the highest per capita income of the 15 countries given in the chart, including countries like Nicaragua, Vietnam, Honduras, Uzbekistan, and others, but regarding healthcare spending, it is the lowest. Does this not indicate a mindset that needs to change its priorities? Healthcare is a state issue, and the individual state has to come up with plans and programs to tackle this menace, which is widespread. However, the state government should not shirk its responsibility in providing adequate finances, technical help and education to the public on health related issues which are urgently needed in most states in India to induce visible changes in the rotting system. Now to take a look at the recent event at BRD. The state government had maintained throughout that the shortage of oxygen was not the real cause of this tragedy, as encephalitis has been the leading cause of child deaths every year due to unhygienic conditions in the hospital. On August 1, 2017, the principal of BRD College, Dr Rajiv Mishra, forwarded the supplier’s letter mentioning the payment that was overdue. On August 5, 2017, the Ministry of Health released the funds. On August 7, funds were received in the account of BRD, and there was an acknowledgment by the hospital. On August 9, 2017, CM Yogi Adityanath visited the BRD Hospital to inaugurate a ward. At that time, the hospital authorities did not apprise him of this shortage. This action could have at least prevented some deaths that were actually due to lack of oxygen. Earlier on the same day in Allahabad, Adityanath had mentioned the encephalitis cases in BRD Hospital and said that the passing of these children was caused by filth and the scourge of open defecation and that the disease has been recurring in eastern Uttar Pradesh since 1978. The Gorakhpur tragedy has taken a nasty turn with blame game in place, and the real issues buried. The tragedy has got enmeshed in the political quagmire with the government taking a firm stand like "guilty will not be spared” and the Opposition demanding moral responsibility of the BJP government and resignation of CM Yogi. How can a 200-day old government bear the moral liability of seventy years of nonfunctioning, corruption, financial shortage and complete break with administration? Having said that, it is the responsibility of the present political disposition in Uttar Pradesh to garner the honesty to overhaul the systems in place, including punishment from the ground up to the top brass level and not a cosmetic paint down to prevent such tragic occurrences. While the principal has resigned of his own accord on moral grounds, it is not clear what the communication between the hospital supplies administration at BRD and the top administrators was. Why did it take until August 1, 2017, almost at the 11th hour to inform the state government of this so called oxygen shortage? Why was the CM not told during his visit? It must be elucidated at what level or hierarchy of administration these crucial decisions were made resulting in catastrophic consequences. If the state released payment on the August 5, 2017, why was it not paid and mishap averted? Was hospital property, including oxygen cylinders, being trafficked to private practices? Why were environmental services through the last decade not beefed up to remove the stink and lack of hygiene at the hospital, which in fact is responsible for more death than anything else? What was the role of the accounts section in the hospital that over 60 lakhs were owed to this oxygen supplier, forcing him to cut supplies? This significant amount must have been generated over time, and maybe appropriate communication could have helped. The need of the hour, however, is for the state authorities not just to have kangaroo courts to appear competent despite opposition pressures. The Opposition while doing its duty has to look back at their despicable performance before pointing any fingers. It is more important that they take measures to pre-empt such incidents in future. The only way to do that is to have a transparent inquiry and guilty be charged with criminal negligence ensuring appropriate legal action including monetary fines and even jail sentences. People are tired of the double standards exhibited by political players to fool the populace, and one certainly expects the resumption of justice and fairness from the present ruling disposition after having trounced every signature of opposition in the recent elections.